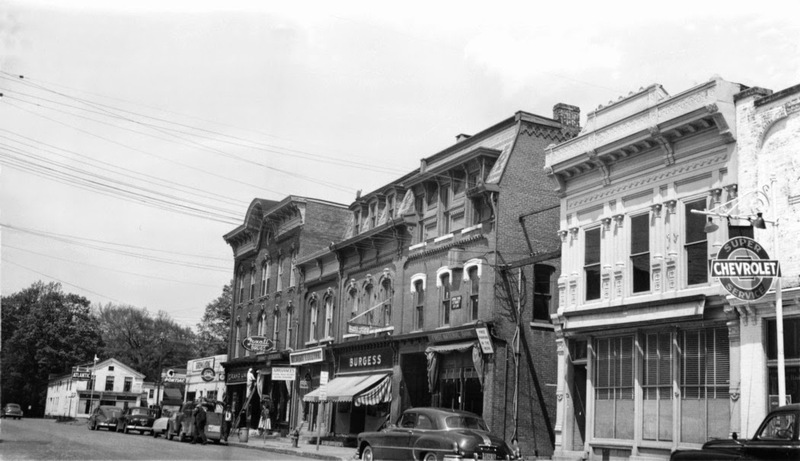 Many people still refer to the building located at 142 Main Street, Moravia, as "the Moravia Bank" when in fact the building started out being used for something completely different and now is one of three banks located in the village, none of which have Moravia in their name. The current Elmira Savings Bank building is actually two buildings merged together. The north building, shown to the right, was built by Hiram H. Alley in the late 1860's as a drug store. In the early 1870's, Mr. Alley built the south half, moving his drug store there and renting the north building as a mercantile store. 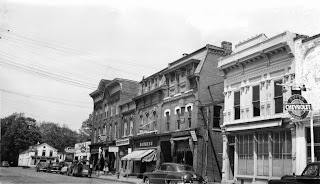 In 1885, Mr. Alley moved his drug store to the newly built Andrews building, where it continued to operate as a drug store under Alley and, later, three generations of the Hawley family for just about 100 years. The First National Bank of Moravia was established on April 6, 1863 and operated for 30 years in a corner of the Moravia House hotel (located where the Kwik-Fill station is today). It moved to the south H.H. Alley building in 1893. About 1952. Bank is 2nd from right. A competing institution, the Moravia National Bank, was chartered on March 6, 1877. It was located in the building at 144 Main Street where New Creations Style Salon ("Gail's") is now located. The two banks coexisted until 1912 when the institutions merged and operations continued in the South Alley building. In the late 1950's, errant youths started a tradition of moving an outhouse to the sidewalk in front of the bank on Halloween eve. Quite often a sign would be left on the outhouse to the effect of "Night Deposits". The identities of the hoodlums have remained a mystery for many years, although photo evidence recently has been uncovered. Rumor has it that the crew shown here removing the outhouse had actually been the same perps who put it there the previous night. These shady characters are as yet unnamed but they look awfully familiar. The bank building began to resemble its present form in the mid 1960's when the two Alley buildings were conjoined and the second and third stories were removed. 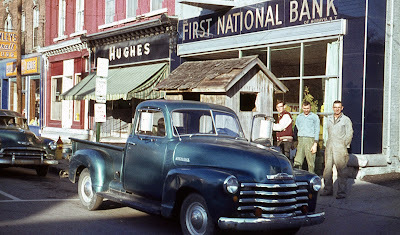 More memorabilia and photos of the First National Bank of Moravia and Moravia National Bank will be on display at COLHS during July and August 2013. © 2011 Cayuga-Owasco Lakes Historical Society. Picture Window theme. Powered by Blogger.